WASHINGTON, DC, April 13, 2011 (ENS) – Conservationists today intervened in a federal lawsuit to fight an attempt to strip critical habitat protections for the Sacramento River population of the green sturgeon, a fish listed as threatened under the federal Endangered Species Act. On March 10, the Pacific Legal Foundation filed a lawsuit on behalf of developers and corporations trying to eliminate federal habitat protections that the National Marine Fisheries Service determined are essential to the conservation and recovery of southern green sturgeon. The case is Building Industry Association of the Bay Area and Bay Planning Coalition v. National Marine Fisheries Service. “This critical habitat designation was not only illegal, it was reckless, because officials ignored the potential pain for the economy in many of the areas they designated as critical habitat,” said Pacific Legal Foundation attorney Ted Hadzi-Antich. “As tens of millions of Americans struggle to find jobs, comfortable federal regulators designated much of the West Coast as critical habitat for the green sturgeon, while refusing to comply with economic balancing requirements in the Endangered Species Act, argues Hadzi-Antich. The Center for Biological Diversity intervened in the lawsuit as the latest in a long list of legal actions the nonprofit organization has taken to protect the rare fish. The habitat protections are a result of a series of conservation actions by the Center, which began in 2001 with the filing of a petition to list the green sturgeon under the Endangered Species Act. This petition resulted in a federal listing for the species as threatened in 2006. 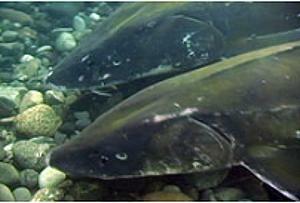 Then the Center undertook litigation to compel the Fisheries Service to designate habitat protections for the green sturgeon. In 2009, the Fisheries Service designated 8.6 million acres of river, estuarine, bay and coastal marine areas in California, Oregon and Washington as critical habitat for the conservation and recovery of the southern population of green sturgeon. The critical habitat includes freshwater river spawning habitat in the Sacramento River and its tributaries, the San Francisco Bay-Delta, and coastal marine habitat and certain estuaries from Monterey Bay, California, to Cape Flattery, Washington. The green sturgeon, Acipenser medirostris, is one of the most ancient fish species in the world, remaining unchanged in appearance since it first emerged 200 million years ago. Among the largest, longest-living fish in freshwater, sturgeon can reach seven feet long, weigh 350 pounds, and survive to be 70 years old. Sturgeon have a prehistoric appearance, with a skeleton consisting of mostly cartilage and rows of bony plates for scales. They have snouts like shovels and mouths like vacuum cleaners that are used to siphon shrimp and other food from sandy depths. The Endangered Species Act requires federal agencies to ensure that any actions they authorize, fund or carry out do not damage or destroy critical habitat. The Center says studies have shown that species with designated critical habitat are more than twice as likely to recover than those without designated habitat. Click here for details of the Fisheries Service critical habitat designation.